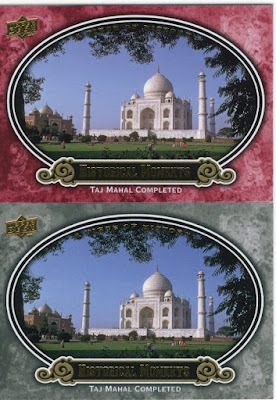 I get two Taj Mahal cards, one red (which is pink) and a regular one. Hooray. On the way to Fenway Park yesterday Sooz and I spotted a Wal-Mart from the highway, and veered off the ramp to find it. Did we really need to go there? No, not at all. Did we get anything worth the detour? Again, no. I loved this set last year because the hobby boxes were so much fun for me. I got many triple game used cards, a quad game used card and just alot of inserts. 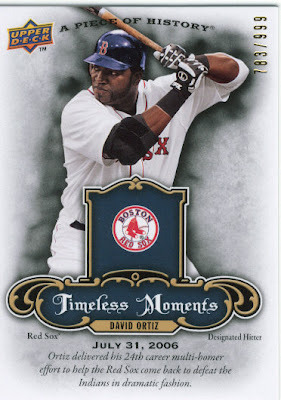 Granted, I have not opened a hobby box of this years so I can't really make a fair assesment but to me the cards seem like a boring do-over. We bought two blister packs each, so 4 packs in total. I was not thrilled with what I got in my packs, then again without anyone I collect it probably wouldn't be thrilling. Between us there was no Albert and no Jeter, and well no surprise there. 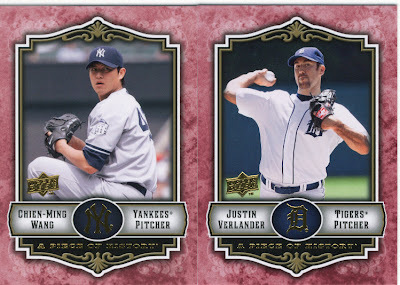 Thank goodness I ended up with a Chien-Ming Wang card. With his ERA I am sure I can trade that for a mosquito or a gnat later in the week. The trip to Fenway was interesting, I enjoyed the park very much and that will be in a post later on. What is up, do you think, with Chien-Mien? Yankees and Mets are both starting with some very bad mojo. Well from what it looks like and what they are saying, his arm strength is not 100% after his time off from the injury. I don't have an explanation as to why he can't locate pitches, but I would assume it all works as one. That was a long time for him to be out of real competition, and Spring Training probably isn't long enough to build up strength and stamina. Should he be able to last more than an inning? Of course. Watching the Yankees lately is torture. Thanks for the post - those cards are very cool. Let's be honest - how annoying is it that the Sox keep on winning, especially the way they are winning. The Red Sox fans are simply insufferable! Have the Sox been winning in a particularly annoying way? I don't think I've been insufferable.